Is Being A Stay At Home Mom Right For You? Home Parenting Is Being A Stay At Home Mom Right For You? Deciding whether or not to be a working mother is one of the toughest choices a new mom will face. Some new moms would prefer to be a stay at home mom, but are concerned about finances or the long term impact on their career. Other new moms want to pursue their careers, but are afraid of the impact on their child’s development. There’s a lot to consider with a decision this big. So you really have to take the time and think about what is truly best for you and your family. While making the decision of whether to stay at home or go back to work, you should not let either your circumstances or other people pressure you into doing something that isn’t right for your family. There are benefits and downsides to both staying at home and being a working mom, so there is no one right way for all moms. So do not feel guilty no matter which option you pick. Trust yourself, you’ll know what the right decision will be for you. Don’t let anyone tell you differently, including yourself. The biggest concern for people considering staying at home is their finances. However, there’s more to this decision than just simply making less money. First of all, you have to factor in the costs of being a working mom. One of the major costs is expensive daycare for your child. You may find after calculating the costs of daycare you aren’t going to be contributing that much money to your household. Another important thing to consider when looking at staying at home, is some of the other savings you will have from having extra time. It is cheaper to make your own baby food, use washable diapers, and even clip coupons for necessities, but if you are working you will not have the time to save this money. So really evaluate your month budget needs before just assuming you need to work to afford your child. Consider the fact that you will not be a stay at home mother forever in your decision. Think about how long you actually want to be a stay at home parent. Perhaps you can stay at home during the crucial early development years before your children begin school and then go back to work. Then, think about the impact on your long term career trajectory. If you are in a career where years of service is how you get ahead, you might want to consider keeping your job. However, if taking a few years off won’t damage your career path, you may want to consider staying at home. Finally, consider the length of staying at home when figuring out your budget. Maybe you have enough in savings to float you for the next couple years or maybe taking a small financial hit now won’t hurt you in the future. So just think about the length of time you would actually stay home when making this important decision. Staying at home may give you the opportunity you need to develop your career. Many stay at home moms take night or online courses to further their education, so when they go back to the workforce they can get a better job. You can also use this time to cultivate networking opportunities like volunteering and working in the community, that way when you reenter the workforce you’ll have a stronger network. Maybe you have a passion project like a novel you’ve been writing, a blog about hairstyles, or a love of painting that you can pursue during this time that can also lead to future opportunities. No matter how you choose to spend your time, you don’t have to look at staying at home as an interruption in our life. In fact, it can be the opportunity you’ve been waiting for to advance your career. There are many ways you can still work and contribute to the household as a stay at home mother. One way is to look into telecommuting. Talk with your job, see if they’ll let you work from home. If not, look at job boards and consider new opportunities, there are plenty of great jobs that let moms stay home. Also consider just scaling back to part time work. Maybe you can work just a couple hours a week or only on the weekends. Finally, consider some of the great opportunities in the growing gig economy. Maybe you can spend this time building and growing an Etsy or Ebay store, or maybe spend a couple hours driving for Uber or Lyft. 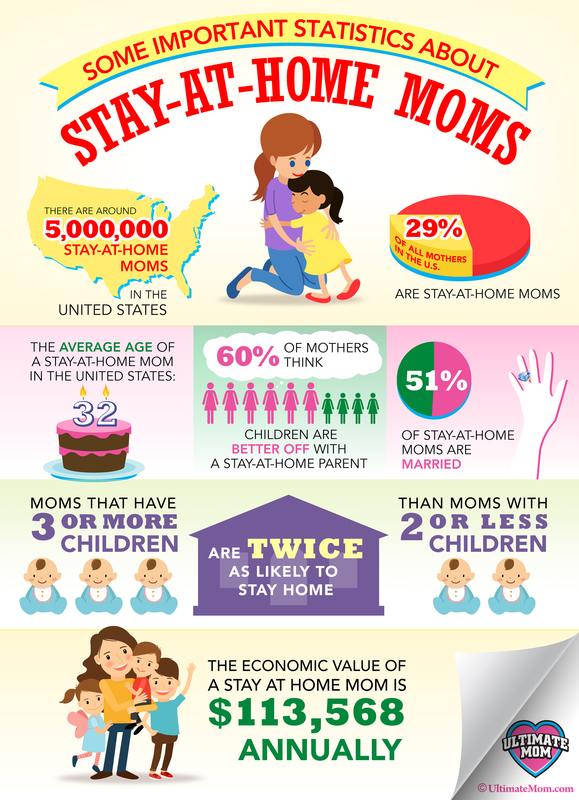 There’s a whole variety of economic opportunities for stay at home moms to balance work and family now. Just because you’ve made your decision, doesn’t mean you can’t change it. So if you aren’t 100% sure that you want to be a working mom and you start going back to work and are unhappy, you can always reassess and decide to stay at home. Same goes with if you decide to leave your job and don’t enjoy being a stay at home mother, you can always go back to work. So don’t put too much pressure on the decision, because if you make the decision and choose the wrong thing, you can always change your mind. No matter whether you decide to stay at home or return to work, just remember you need to do what is best for you and your family. So put all the stress and pressures aside and think about what you really want. No matter what you decide, just know that you can definitely make it work.